This peak is #92 in Prominence List for British Columbia .The summit previously had a radio tower and helipad, along with a bunch of junk related to these. However as of 2018, this has been removed. Dunn Peak offers one of the most astonishing views imaginable, and surely is unique in British Columbia. North lies Trophy Mountain and Raft Mountain; the bigger peaks of the Premier Range are hidden behind. The Monashees stretch across the horizon from NE thru E to SE. 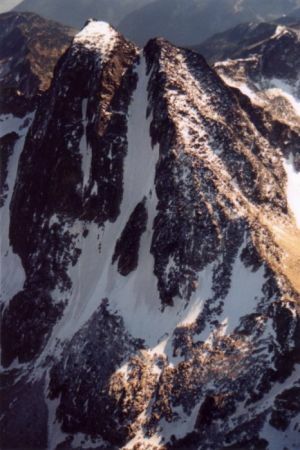 ENE is a large, distant, half-snowy peak: Mt Clemenceau, about 170km away in the Rockies. Just N of E is another very distant peak, a rocky pyramid: Mt Sir Sanford, 150km off in the Northern Selkirks. The Interior Plateau fills most fo the rest of the panorama, but far, far away in the SW in very clear conditions one can make out a high range at the fringes of the Coast Mountains, perhaps the Marble Range, or the Shulaps.